Just when I thought I had exposed every personality trait a head of kale might present... whirring it into a variety of smoothies to coax its more savory tendencies and rich nutritious properties into fruity morning blends; taming its traditionally robust nature with delicious vinaigrettes in various salad pairings; encouraging its gentler side with a slow sauté; chopping it into hashes and mashes, soups and stews; and roasting and grilling it to crisp perfection ... we came across a lightly grilled kale salad in recent travels that showcased yet another flavor profile from this hearty green. And one that is not to be missed. At Forage, a delightful restaurant tucked into the Listel Hotel in the West End neighborhood of Vancouver, British Columbia, the menu is just that... foraged from the land and sea in and around this beautiful area hugging the pristine waters north of Washington State, supporting local farmers and fishers. Though there was not one dish of the many we savored that didn’t completely please our palates, this seemingly unassuming little salad was such a welcomed treat. Simple. Elegant. Brilliant. Akin to the magic that grilling imparts upon a modest head of Romaine lettuce, enticing textured nuances of smoky, sweet flavor in both crisp and delicate folds of wilted greens... kale is similarly transformed with a light toss on a hot grill. While grilling or roasting kale on high heat for a good bit of time will render a crunchy chip-like consistency, just a light tossing on a hot grill will coax a delightfully subtle, smoky-sweet quality and, in so doing, gently tame kale’s sometimes tough demeanor. The salad we tasted featured a light vinaigrette that melded sweet honey and creamy, pungent blue cheese... and possibly a little marmalade of sorts. The gist is that it had that lovely sweet-savory balance that works wonders on this humbled green. It was delightful perfection. In my own take on the salad we so enjoyed, leafy bits of curly green kale (torn or roughly chopped from its tough center stems) are grilled until they just begin to wilt... too little time and you won’t tame its stiff bristle; too long and it loses its subtle charm and crisps up too much. It’s just a minute or more, depending on how hot you get your grill. When it begins to show a slightly golden burnt tinge here and there and just a sublime wilting, it’s ready. 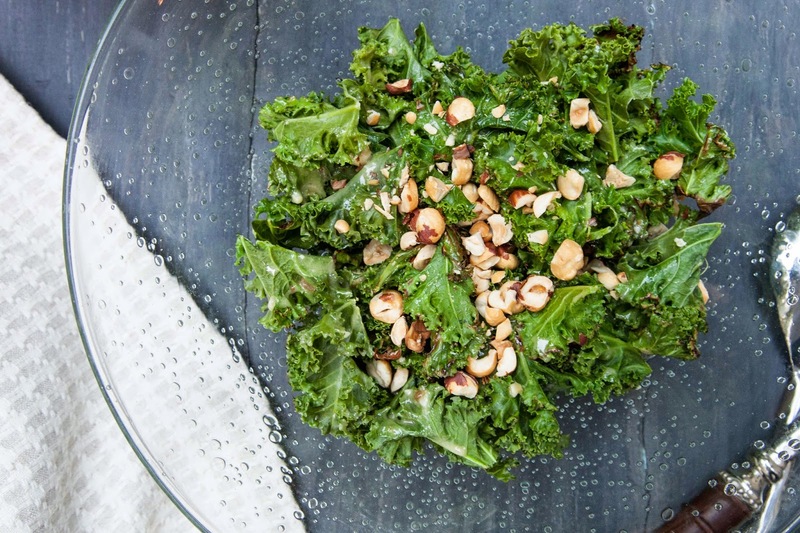 Like the Forage-plated salad, this version is lightly laced with a flavorful dressing that pairs beautifully with the grilled kale for a strikingly simple, yet elegant plating. Then, like its inspiration, it’s topped with a good crunch of chopped hazelnuts. 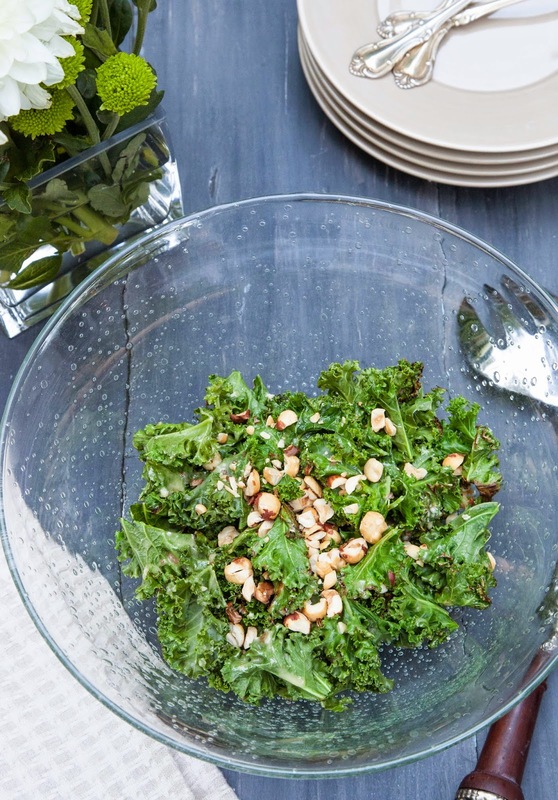 This salad is such a welcomed introduction to yet another satisfying profile of the many pleasing faces of kale... subtly tamed and pleasingly humbled, yet still nicely assured… displaying all the qualities of a great dinner partner. 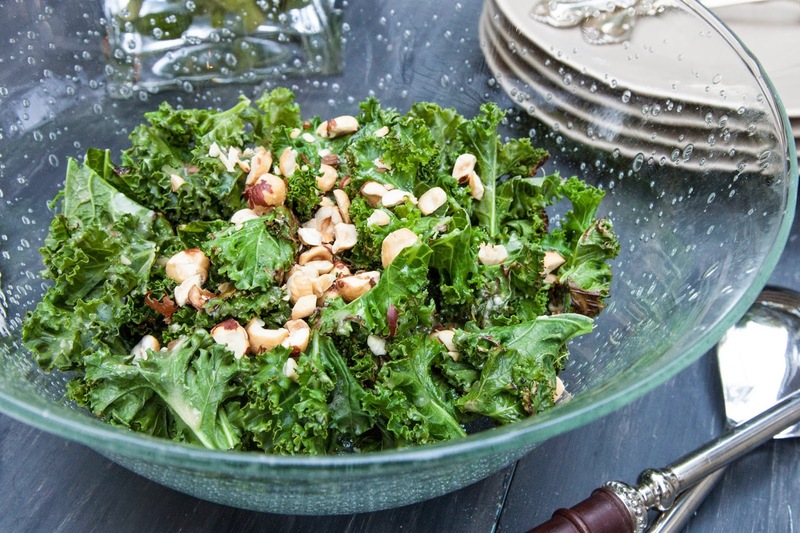 Inspired by the Grilled Kale Salad at Forage restaurant, Vancouver B.C. While this plating was made for two, it’s an easy one to increase. Likewise, it’s easy to make inside or outside, as long as it’s tossed on a hot grill. Depending on how light or heavy you prefer it dressed, you may have just a bit of dressing left over. Break bleu cheese up a bit and toss into pitcher of high-speed blender along with apple cider vinegar, honey and jam. Blend on high (or “dressing” setting) until emulsified and smooth. Add in olive oil and blend until just incorporated. Add pinch of salt. Set aside. Lightly oil hot grill (with corn oil or other high smoke point oil*). Add torn leaves of kale to hot grill pan (you’ll hear a nice sizzle). Using tongs, gently toss leaves as they grill. After a minute or so, there should be a nice tinge of color showing and the leaves should be just subtly wilted. Transfer greens to a bowl and let cool for just a minute or so. Dress lightly with vinaigrette and toss gently to coat. Add chopped hazelnuts or plate and top with nuts, as preferred.